From Downtown Saratoga: Go south on Broadway, which turns into Route 9. 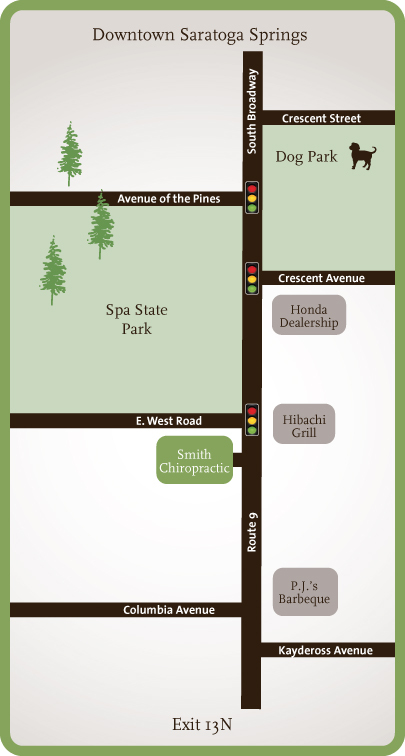 We are the second stop light beyond the Avenue of the Pines entrance, across from the Hibachi Grill. From I-87: Take exit 13N. Go north on Route 9 for 1.5 miles. We are located on the left just beyond PJ’s BBQ and across from the Hibachi Grill. If you’re in pain after regular office hours and don’t know what to do, ice, heat, rest, etc. This can be a very frustrating, scary, situation that you often just need some common sense advice. Please call Dr. Smith directly on his cell at (518) 361-1642. He’ll be glad to help!